with a lot of good company!! 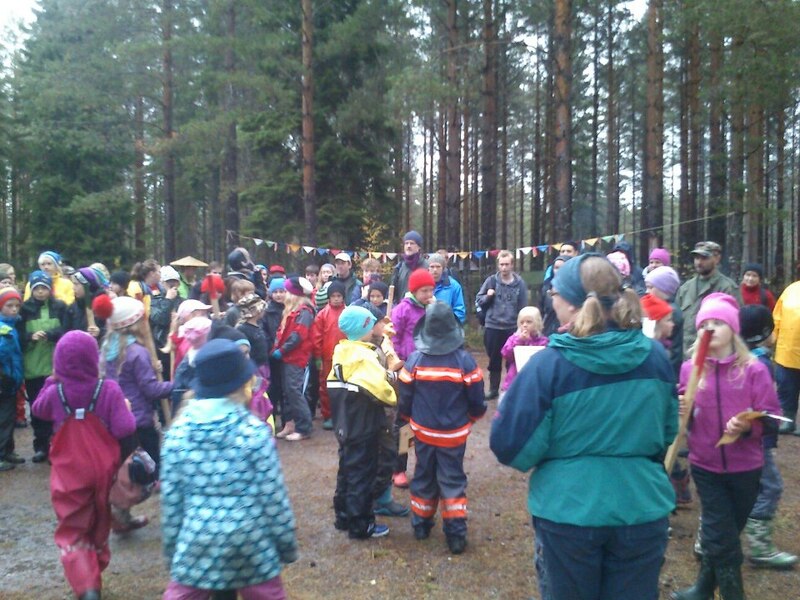 The first event I attended as a scoutleader was a succes, despite of the weather. Given the fact that it would be a long day and that the weather wasn't playing along nicely, I had taken my precautions, meaning bringing a poncho, my finnbag and the means to make a hot drink. I hung up the poncho as a rainshelter and settled underneath it. I did get some surprised, yet positive reactions to that. In between the scoutpatrols showing up at our post, we had plenty of time. We clowned around, had coffee, tea and lunch, had some good conversations or just sat there, listening to the occassional raindrops hitting the poncho, passing birds and hearing children's voices, barking dogs and gunshots in the distance. There were other groups active, too. Hunters and and a group of people doing their thing with Laikadogs. As for the scouts turning up..... They ranged from somewhere between 6 and 13 or 14 and I was pleasantly surprised and impressed by their enthusiasm and will to participate, especially the older ones! I am still to much used to the superficial and lazy McDonalds-kids I used to know, I guess. Unfortunately they did not show up in the numbers we had hoped for, but that didn't really matter. The ones that did, I guess about 100, were having fun and enjoying themselves and we had quit a few laughs with many of them. Here's a pic of the patrol with my kids; sven standing with black cap and shoulderbag on the left and Annalena, the shortstop with camobeany on the right. I did not here one complaint from either of them all day, despite the rough conditions of the terrain and the plentyfull moisture all around!! And their patrol did well, too; ending up second in their class. All in all they had to complete around 15 practical situations, including a mockup accident (!) and around 50 theoretical questions. I am one massively proud dad, here! And at the end of the day it started to rain harder and without further thought I hung my cookingpot with its hook underneath the corner of the poncho in order to collect the rainwater and refill my canteen. My companion looked at me amazed.... Something that was so logical and sensible to me was completely new to him, despite having had several years of scoutingexperience and having re-entered the scouting as a staffmember after a few years of absense. It struck me that, even after the short time I am actively out there, things are starting to become second nature allready. The water ran straight into the pot and the heavier that one became, the more it weighed down the corner, causing the water to run in even faster. This was made even clearer about an hour or 2 later, when we were all done and started to gather around the central firepit at the coaler's cabin. The fire there had died out, leaving behind some slightly glowing coals. I was asked to get the fire going again, so I went to get some dry wood and, together with some birchbark and a few thinner pieces of wood, blew the fire back to life, showing the others that there was no need for the matches and firestarterblocks they were handing to me. Around 17:00 every group had finished the course and the prizes were handed out. As said my kids' group became second in their class and another group from our scouts came in first in the youngest class! this picture was made by another staffmember, Ylva S.
It was a relaxing day out in "the greens", despite being out there with a lot of company and actively using a different language all day long, some things I am absolutely not used to. I even met some of my to-be-neighbours, which welcomed me and my family into the community. One of them turns out to be my buddy from today! We went home tired, wet, hungry and satisfied..... all of us! So we'll be moving house shortely, heading up north a little more, but only a little.... I'll say "goodbye" to the fields of grain and the river and move to an area, which is much more wooded, to a small community in the northern part of this municipality. It is the area where the charcoalkiln is situated, too. Our house is situated in between 2 lakes, both at 200-300 meters distance, so fishing will be very high on my to-do-and-to-learn-list. And if I weren't quit busy with that, next to working, I am being kept busy with the scouts, too. There is a major event coming up next weekend to which an estimated 150-250 scouts will attend and our group has the honour of organising it. Quit a handfull, but luckily I am being kept out of the wind a bit, since I'm the new guy around. That does not apply for the weekly meetings in which I have had a major role. The first evening we went up the hill to the windshelter my oldest daughter had her first scoutovernighter, to do some maintenance. I really had to get used to being out there with a group of kids, since it was far from quite..... On the next meeting we've also been building waterfilters with charcoal and such and here's where my experiences did come in handy. The underlaying thought was to make the kids aware that not everyone is as fortunate as we are, simply because we have drinkingwater, whenever we turn on the tap. It was great to see the kids being very busy and enthusiastic. They were sceptic at first, when I mixed the drinkingwater with concentrated vinegar, a bright red foodcolouring fluid and a good handfull of dirt. Their faces spoke volumes when at the bottom there was clear drinlingwater without odours are taste..... and I tasted them all. Got to set an example, right? New country, new language, new responsibilities and a whole new field for me to operate in! I am honoured and exited! Since I showed you how I was introduced to charcoalmaking, I think it is appropriate to show you how it all ended this weekend. Saturday we opened up the kiln in order to spread out the charcoal, so it could cool down and today we went back to pack it all. Sounds all very easy and it is.... in a way, when you do not take into account the fysical labour and large amounts of smoke and coaldust one is to endure. First you have to start to dig out the actual coal by removing the topping layers of gravel and spruceboughs. After that you can start to rake out the charcoal. Quit labourious, dusty, smokey and warm! As you dig deeper, you begin to disassemble the sidewalls in the proces. The hot charcoal is than sifted, removing small pieces, ashes and gravel. After that the coal is spread out in order to cool down. You have to vigilant constantly, since much of it still is glowing. We had a bit of a breeze, while working, so quit a few times the coal lit up or started to burn. We needed a few people of constant fire extinguishing duty and the kids were happy to help! My son hard at work. Even the smallest did their part. Here my youngest, busy adding stickers to the bags for the coal. My turn in "the pit". The reward for my family; a large bag full of charcoal we helped to make. But the other rewards (lots of woodtime, good company and comradery) are priceless!! 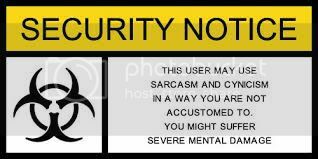 I was warned though. This kind of coal tends to get real hot. Unfortunately a lot of the wood was not charred.... But nothing, or not much, goes to waste. The wood is cut up and stacked. This way the hut, or even the grill's fireplace, can be warmed for many a cold night, without the need to cut firewood. The entire area was cleaned up and even raked with a lawnrake, to make sure as much of the coal and remains are cleared from the site. This debris, a mix of gravel, ashes, small pieces of coals and forestflootlitter, is gathered in a large U-shaped wall and will be used as toppinglayer on next year's kiln. The poles, struts and supports are gathered, too and will see another year of service. And I just hope that I, or better even we, will be able to help and witness the complete proces from the beginning, next year! smoke, sunshine and trees..... pure magic! A very strange...... fungus? Lichen?? This is how kids should be playing! Building shelters, climbing trees and just happily running around. 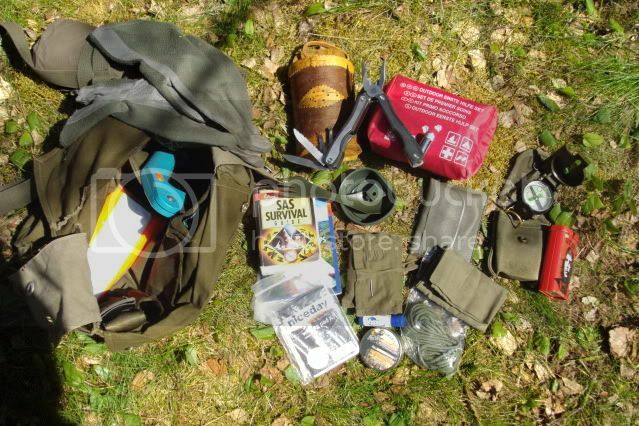 Appearantly there this 3-item-buzz going through the online outdoorcommunity and I've been asked/tagged to think about and show my 3 most favorite items by outdoorenvy and he by the weekend woodsman befor that. Normally I would not take part in these "pass-arounds", but it gives me a reason to rethink my gearoptions. My 3 favorite items..... I gave it quit some thought and I came to the conclusion that I do not have any real favorite items. No items I would go without. My gear.... well, it's just my gear. Tools that serve a purpose and which can be replaced without much trouble or heartaches. Or at least that's what I thought in the beginning. But the longer I tought about it, the more the subject of heartaches stuck with me and it became clear that I do have favorite items and that I can categorise the rest of the stuff in several levels of being favorite. There is the stuff that still falls into the tool-categorie and this group is by far the largest. These are the cheap, plastic or otherwise nonspecial pieces of 13-in-a-dozen-equipment I use. Items like my Dutch messtins, canteens, ponchos and most of the other surplusthings I own. Most of this stuff I'd sell right away, if shipping weren't such a killer, here. To be honest, most of this stuff only actually gets used on groupoutings, whenever I have guests, for instance, or on familytrips or maybe with the scouts in the furture. Then there's the stuff that I regularly use and like, but which still is easily replaced and which have no special value to me. 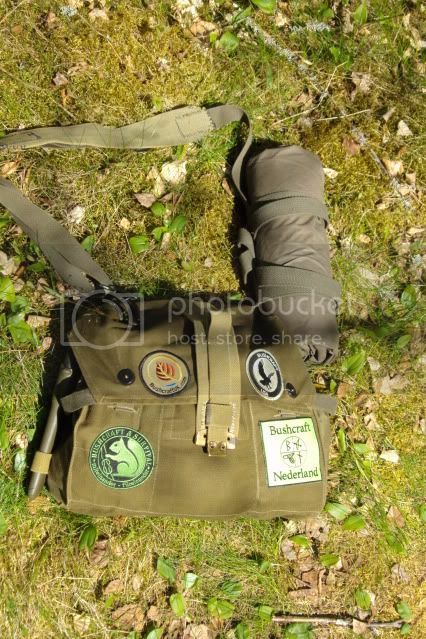 Stuff like me canvas Swedish backpack and messkit, the Mora clipper, the Finnish gasmaskbag and all the other, mainly older items. These items have a real and by now proven value. The gasmaskbag is a little above that, because it was a gift. And than there is that categorie of items I do cherish, but mostly not for it's usefullness, but more out of sentimental values. 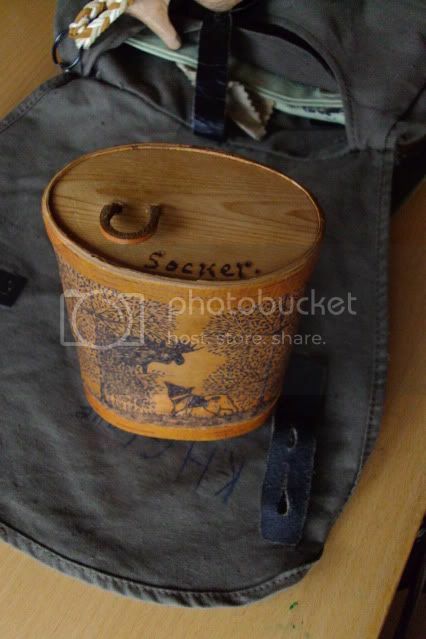 Items like my old army SAK, my birchbark coffee- and sugarcontainer, my WW2-compas and the pouch for it my daughter gave me and others. But, as said, this gear more often than not stays at home. So.... how do I make my choice on my 3 favorites?? Simple, I let my heart speak. What items do bring a smile on my face, when ever I use them, hold them or even think of them? First of all, there's my woolen military gear, especially my Swedish army pants and my Scottish wooly pully. For most of the year I can not wait to put them on and it makes me sad to put them away for summer. They make me feel wonderfully comfortable everytime I do wear them. It does its job by keeping me warm. Allthough these items are surplus, the pants have a sense of history and nature to them; 2 things I have a soft spot for. So does the pully and as icing on the cake it was a gift. My third choice would be my old army SAK. It was handed to me as standardissue, when I joined the Dutch army in 1990 and has been with me for most of the time since. The knife and I "shared" a lot together and it feels comfortable to just hold it. It is basic, no-nonsense and functional, with a large touch of personal history. And if I'd had to pick a forth, than I'd have a tough time chosing between my hunters' coffee- and sugarcontainer and the gasmaskbag. The coffeecontainer for it's emotional value, its esthetics and for representing my thoughs and feelings , the bag simply because of its usefullness, functionality and, so far, it is building up a history with me too. The container isn't particularly handy, because of its size and vulnerability. It has a tendency to get stuck in damp weather, too. The bag isn't exactly a beauty, but has proven its worth so far. The urge to start foraging - instinct?? It is that time of year again..... The air has that certain chill again and is filled with a sweet, heavy and rich scent of damp earth and decomposing plantmaterials. Birds are gathering to start their migration. Grasses have turned a golden yellow and seem to reflect their colour on everything around me. Fog rolls across the land, depositing their moisture on everything it touches, leaving the surfaces wet and glistening in the light. The sun still has warmth left in it, but the shadows and evenings are destinctly getting longer..
Every year it happens again; at the end of summer and the beginning of autumn I have this strong urge to start foraging. There's this abundance of food everywhere, but much of it is out of reach; either because it simply isn't mine or I do not yet have the knowledge or skill to collect it. I see many ripe berries and mushrooms, wondering if they are edible, am excited whenever I come across species which I know to be and yet I do not take more than a handfull, thinking the animals will be needing it harder than I will. I can not look at a flock of passing geese, without at some point thinking that a few of those would make some good meals for me and my family and I wonder what they'd taste like. The same goes for deer or even cattle! I see myself stalking through the woods and meadows, hunting, killing and even dressing an animal, to take home and feed those I call mine. I like looking at fields, filled with ripe wheat or rye, and seeing it being harvested, ground to flower and baked to bread befor my minds' eye. For as long as I can remember I loved to see, hear and smell the farmers harvesting their crops. As a young boy I could stand for hours next to the fields and just look and smell. and now, since we live here in Sweden, that urge has become even stronger, probably because we live and exist closer to the source now. Unfortunately for many of these things I lack knowledge and skill or even permission. I do not know many mushrooms, I have no hunting- or gunpermissions, I have no crops to harvest or cattle to slaughter and I am so envious of those who do! I love to read about people, who do all these things and tell about it, either online or in books. But all that will change in due time and I will be joining them! And it makes me wonder..... Is this harvesting, this stocking up and this preparing a product of the things I see and read about or does it go deeper? Is it a more fundamental need. An instinct maybe? Wohow... I'm on a roll here! My previous shortage of "greentime" is being made good and this weekend was an absolute high. 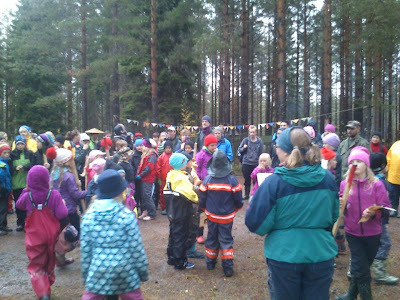 The first event we had planned was the socalled "skogsdag", meaning woodsday. That is a manifestation of several companies, associations and other groups, which are related to the forest, like loggingcompanies, scoutgroups, protectionfoundations, government in various ways etc. For my oldest daughter and me this meant we went full circle, since this was the first event we went to together, when we moved here. How much has changed since than! Now we could talk to people, understand what they were saying and we met people we know. Afterwards we'd go up to the charcoalkiln together, again and spend the night there. There was plenty to see and learn. We paid special attention to the stand with all the fungi; edible, poisonous and even quit a few you can use to dye wool and clothes. We collected a large number of flyers on several subjects, so we can both practice the lamguage and learn something on a, for us, important subject. We got to special little books; one on treespecies here, so I can learn about them and learn what they're actually called and one on butterflyspecies in this area. A good way to spend extra time with the girls. I also had the opportunity to learn about some things I was very keen on learning. We met a group of reenactors from the vikingera. They brought with them a horsebow and some flint and steel strikers. Because I have fysical limitations I can not use a longbow or related bows for a length of time. After shooting a few arrows, my shoulders stop playing ball. I had gotten some advise on trying a horsebow. They are much shorter and put much less strain on your body. Now I had the chance on trying that! And it worked wonderfully! I had the opportunity to shoot, feel the bow and especially NOT feel my shoulders afterwards. I also learned that there is an archeryclub in the town next to ours, about 8km away... Yes!! Guess what I'll be doing shortly! They also had some flint and steel there and I had to opportunity to try those as well. The guy this belonged to explained to me how it worked, but only managed to knock of some splinters from his stone. After a few strikes I was able to get sparks and even some longer glowing ones, which would have been able to get some tinder going. He looked at me with a face that was clearly saying:"You did this befor, right?".... wrong..... I just read about it carefully. 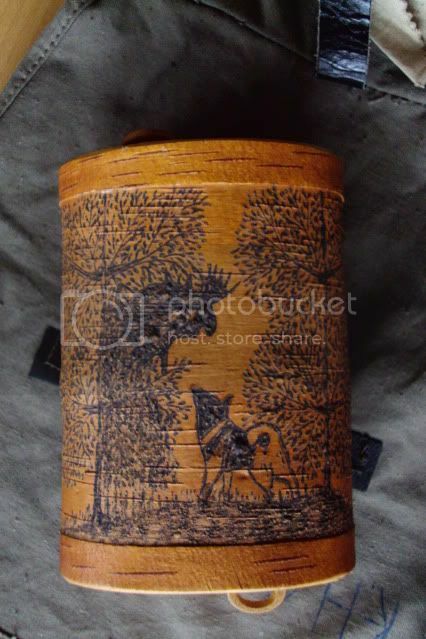 Another thing I learned about was making and collecting pinetar. I had the proces explained to me, they showed me what wood was best to use and how easy it actually was.... as long as you know what you're dong and take your time doing it. All in all it was a very informative and pleasant day. A few hours very well spent! One of the teammembers we were about to relieve. He and his wife did stay for the rest of the night though, allthough they were relieved shortly after we arrived. The work continues around the clock. Every 2 hours the first few days, but now it was about every 3-4.
yep... me cooking again..... Bacons & eggs this time. Kids playing as they should; building shelters, climbing trees and running around in the woods. Found this flying insect too! The three fingers are mine, so you can get an idea of its size! We really need to work on our familylogistics. We forgot quit a few things and found out other things did not work as we had hoped.